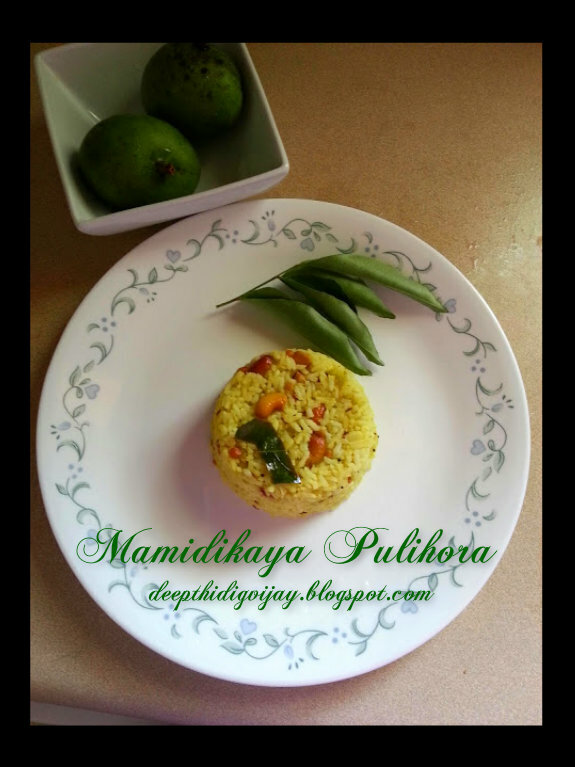 Mango fried rice also known as mamidikaya pulihora in our regional language. After a very long time I was able to bag some raw mangoes form the Indian store. I am glad that I found them, because I was craving for this rice since last month. I didn't even remember when was the last the time I had it. Mango pulihora is easy to prepare and delicious in taste. Cut mango and grind it to a coarse paste along with little salt and green chili. Heat oil in a pan and add Chana dal and urad dal and fry till they turn light brown. Now add mustard seeds, cumin seeds and wait till they splatter and add green chili, red chili, cashew nuts and curry leaves (optional). When the green chili is cooked add in turmeric and salt and mix well, now add mango paste and mix well. Cook for 5min stirring in between under medium flame. Now add rice and mix well, cook this for about 1min and turn off the stove. The pulihora is ready to serve. I hope you like my recipe. This is one of my favorite version of pulihora.. Looks very tempting. Tasty and tangy looking rice. Love this mango rice.,seriously makes me drool. Thank you all for stopping by!!! Very interesting. I'm looking for a healthy recipes for my children and based of your recipe ingredients, it is healthy and low cholesterol so I want to try your recipe and hopefully they will like it. 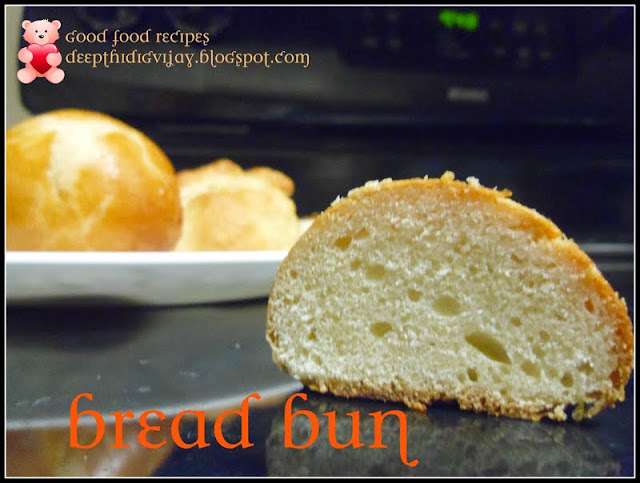 Thank you so much for sharing and I'm looking forward for more recipes that will be posted. 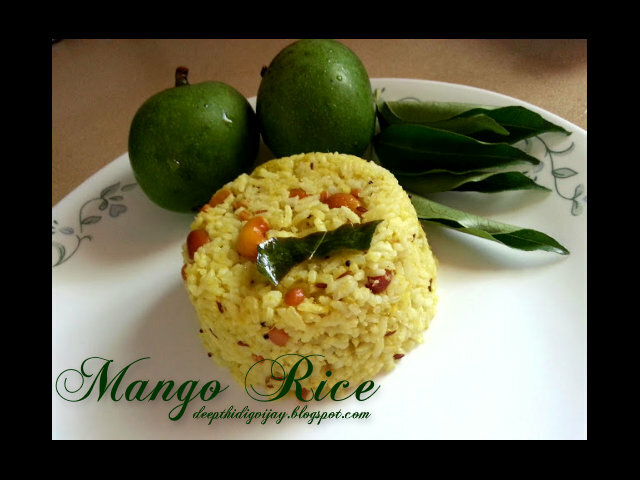 Great collection of recipes!u have alovely blog Deepthi!rice looks awesome! 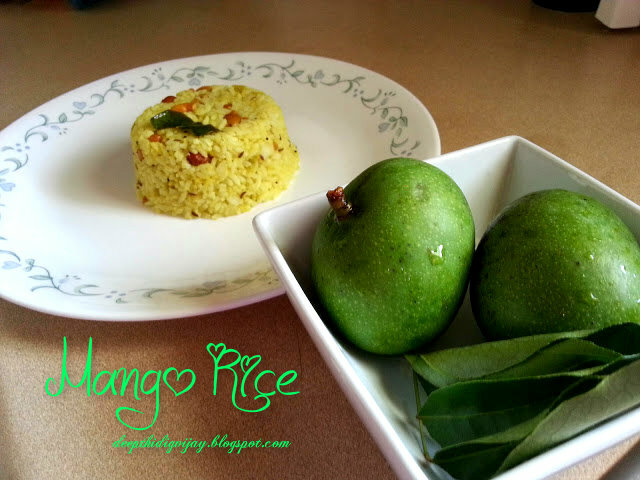 I had never heard about mango and rice recipe together. This is new and exciting for me. I like added flavour of cashew nuts and curry leaves. I will consider this as Healthy Food Recipes in my upcoming book.